Oil on board, 11" x 12"
$650.00 + $10.00 shipping in US. This is one of the larger paintings I've been working on recently. 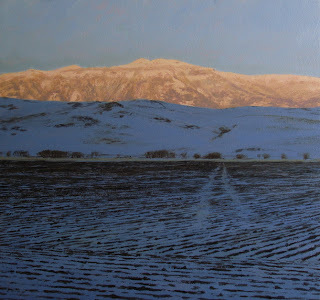 Out in the valley's plowed fields, I watched the sun settle below the mountain rim. As a sharp-edged shadow rolled across the valley floor and up the foothills, the higher mountains glowed in their snowy coats for a brief moment, then sank into the darkening sky. I suddenly felt so conscious of the "ride" I was taking on this great turning globe of earth. Nice! Those are great moments - when we realize that we're on a planet, hurtling through space. I live just north west of Denver, and every day, I watch the sun rise and fall on the mountains. Although you are looking at different mountains, you have captured the light and shadows perfectly. Good one Don. I'll usually read what you have to say before I click to enlarge. This time I went right to the click. Very intriguing lines and design. Love all that shadow up front. Have you seen the Carl Sagan pale blue dot video? It fits in with your thoughts on this one. Suzanne, the routine aspect of our daily lives takes precedence much of the time, doesn't it? Those moments of clarity--the sense of one's participation in a great and awesome mystery--are precious. Bill, you live in a beautiful place. It's great to have those wide open vistas. Thanks for commenting. Frank, I sure appreciate your words. I'd like to say I had seen the Sagan video "billions and billions" of times, but I had not. Thanks for the link--a reminder of our place in this astonishing universe. There's so much I like about this. I'll focus on one thing... the diagonal stripes crossed by vertical tire tracks that lead the eye further in to the landscape. I'm not even going to mention the brilliant peach foothills sandwiched between blues. Another thing that makes you realize how small we are, is looking at the night sky. I liked your painting of the eclipse. 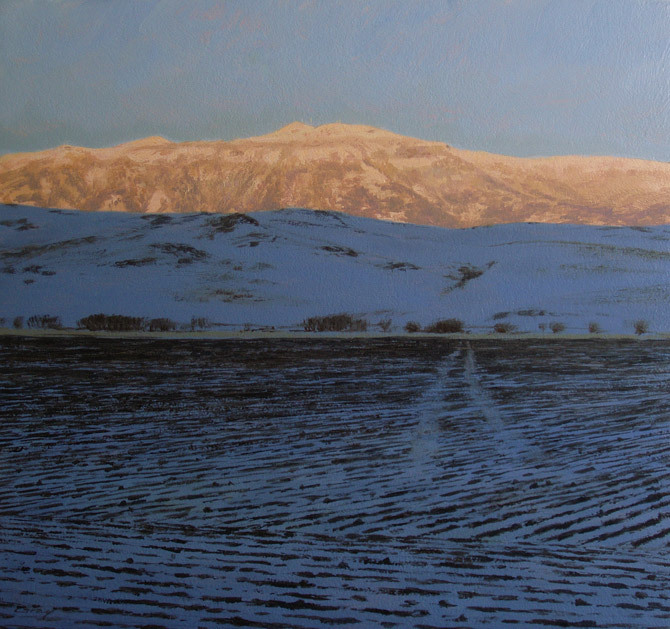 Those patterns in the plowed field were what drew me to this scene in the first place, Silvina. Thanks. Beautiful Don - I really feel like I'm there experiencing the moment. Well done! Hi Rowan, thanks! I'm glad you stopped by. Holy Moley. That's terrific, Don. I look forward to seeing "your view" every day. But today, couldn't resist telling you how gorgeous this one is. And it looks like I'm not alone. You've really expressed the exquisite beauty of being human and our connection to the earth. Thanks a bunch, Jason. I'm sure enjoying your blog. Kimberly, what you said is very meaningful for me. Thank you for those kind words. I've got to stop by more often, you have all new paintings and they are beautiful! You really have captured the mood of the moment. Marcia, I really appreciate your visit--thank you! You've certainly conveyed that awesome sense of the 'ride' and the smallness that is us. Love those late afternoon shadows. Nice of you to say, Triecia--thanks very much. Just wonderful Don. In my own work I am really intrigued with the patterns and movement that agricultural activities create and suggest and you have used that beautifully here. all that and a sense of the quiet stillness of dawn. well done! Thanks, Deborah, for the thoughtful note--much appreciated. This is spectacular work, Don.